Here is the book that fully explains the origins and effects of the money and banking cartel, and what happened in US history to transform the dollar from something that was as good as gold into nothing but a scrap of paper whose value is dependent on political appointees. The Rothbard classic in its first audio edition! There aren't many economics books that read like novels, but this one teaches and entertains at the same time. From the 17th century to the 20th, Murray N. Rothbard follows the ups and downs of American money. Buffoonish and evil politicians, the banking cartel, the cabal that established the Federal Reserve, Lincoln's greenbacks, FDR's stealing of the gold, the Fed and the Great Depression, and so much more, it is all here. Most important, this book teaches us what we need to know about the nature of money, and why government's sticky fingers spell the end of its soundness, with horrific results. The best sort of history, the truest of economics, a warning and advice for the future: they are all here, from the best writer ever to get a PhD in economics. This audio book is read by the master of the genre: Jeff Riggenbach. 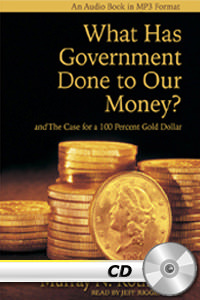 He also gives us the additional essay that shows the way out: "The Case for a 100 Percent Gold Dollar." Listen to this sample.